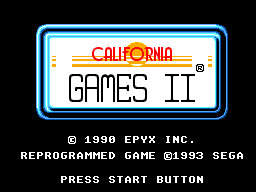 California Games II (known as Jogos de Verão II in Brazil) is the direct sequel to California Games, by Epyx, originally released for various home computers in 1990. The game saw a conversion to the Sega Master System in 1993, developed by Probe. The Master System version keeps four of the five events from the other versions, with the removed one being Jet Surfing. Main article: California Games II/Magazine articles.